Early in the twenty-first century, United States foreign policy began to be talked about as having undergone major changes. Journalists and academics began to speculate that with the advent of the George W. Bush administration and its reaction to the events of 11 September 2001, the U.S. was now acting toward other countries in a way that was fundamentally different than in the past. 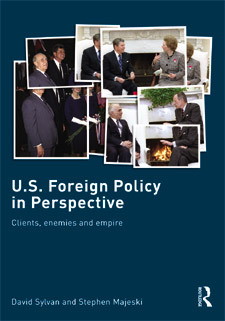 Those differences included a more frequent resort to military force and a concomitant downgrading of diplomacy; a penchant for acting unilaterally rather than with allies or through multilateral institutions; and an ideological classification of countries into friends and foes, with the latter being combatted even if they did not pose a military threat to others. In short, whether this was seen as good or bad, the United States was said to have shifted to a fundamentally imperial stance toward the rest of the world. These types of claims are misleading. On the one hand, they greatly exaggerate just how much U.S. foreign policy was militarized, or unilateralized, or ideologized, under Bush; on the other, they present past U.S. policy in a considerably more diplomatic, multilateral, and modest light than was in fact the case. Both criticisms are easy to demonstrate and we do so in the following pages. Specifically, we show how, from 1898 to the present, U.S. foreign policy has been fundamentally continuous, with the same types of routine and interventionary policies being opted for in similar situations. What this continuity involves is not an unchanging set of long-term goals but rather a small set of means, resorted to over and over as a means of taking on as clients certain states and supporting them, while at the same time actively opposing other states as enemies. In this sense, the book is both a detailed description of American foreign policy today and a history of how, within rigid limits, that policy evolved over the past eleven decades. However, the broader question is why U.S. policy in fact changed as little as it did. To answer that question, we put forward a theory of how foreign policy gets made on three different time scales: day-to-day, when the problems dealt with involve the execution of existing policy; episodic, when that policy fails and has to be reevaluated; and epochal, when there is a sense that a historical turning point is at hand. To come up with this theory, we found that existing approaches to foreign policy analysis were of little use, mostly because they failed to take into account the details of how particular means were opted for in specific situations. Instead, we found that other intellectual traditions, namely cybernetics and organization theory, gave us the theoretical tools to explain the different types of policy continuity. Those explanations involve showing how policy is means-driven, through the availability of capabilities embedded in organizations, rather than spurred by any long-term goals or structural concerns. To develop and test the theory, it was necessary to look closely at what precisely the U.S. was doing with regard to specific countries and at how the debates over what the U.S. should be doing unfolded in Washington. This meant that we had, as much as possible, to rely on primary source materials about the contours of U.S. policy, since secondary accounts were not always concerned with the same policy making issues as we were. It also meant that we had to amass a large number of cases of concrete U.S. policy making regarding specific countries, not only because continuity can only be demonstrated by showing that the same types of policies were opted for repeatedly over the course of more than a century, but because policy depended on the type of situation, and there were, by our count, some twenty-three of those. (There are, in fact, a small number of variables that generate those separate situations.) Although many of the cases are written up in the book, many others are simply mentioned, with full discussions of them being reserved for the book’s website. The theory we develop, the history we recount, and the description we put forward all point in the direction of the United States as possessing an empire of client states. That empire has been in existence for many decades and, we argue in the final chapter of the book, shows little signs of ending. Whether or not that is a good thing we leave to the reader to decide; although our views are easily discernible from the tone with which certain passages are written, this is a work of scholarship and not of advocacy.